In Indian tradition peacock symbolises Royalty with Spirituality andexemplifies the beauty of nature with its vibrant colors and gleaming hue. This was the inspiration for design when Navrathan Jewellers designed their Jhumkas. Jhumkhas are a major fashion statement these days as they are best suited with an array of traditional attire and designer outfits. Timeless designs cast in pure gold with glamorous precious colored stones, make a statement and set new standards. In India, the Peacock is associated with the Goddess Lakshmi who represents wealth, patience, kindness and luck. 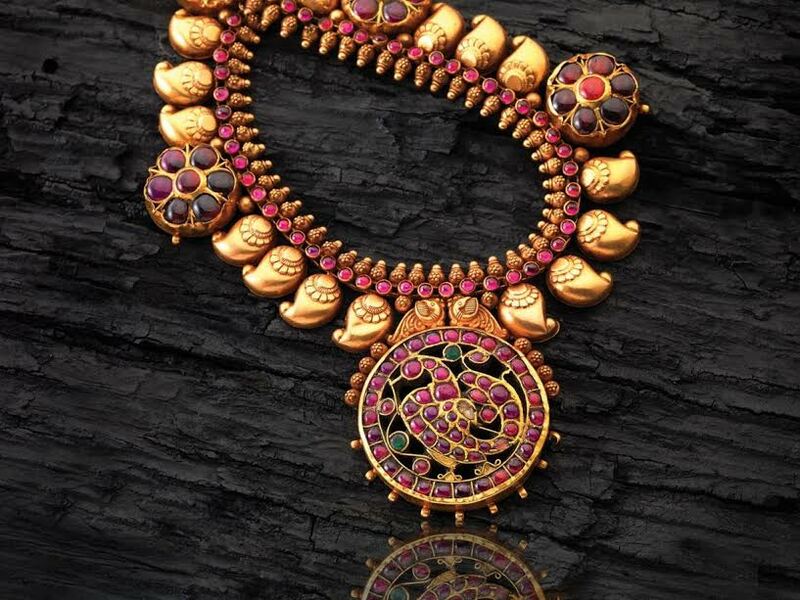 Navrathan Jewellerscaptures the true spirit of nature at its best with their exclusive Masterpiece. This bold jewellery collection is the perfect embodiment of the feminine spirit, stunningly opulent with a subtle and elegant touch to make every woman feel and look special. Timeless precious stones, Rose cut diamonds, Rubies and Polikes made by master crafts- men in gold make this an heirloom for every Indian home.